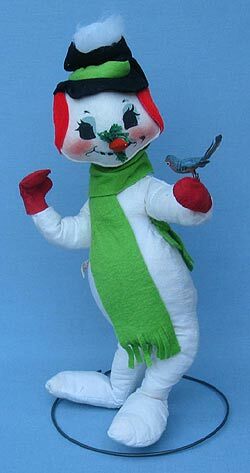 Home :: HOLIDAYS :: CHRISTMAS DOLLS :: ANNALEE SNOWMAN :: SNOWMAN 18" to 21"
Annalee Doll Description: Open eyes, black nose, battered black hat, multi-colored stars and stripes print scarf, red shawl with white fur trim, green and yellow mittens. Very common for hat to have creases due to storage and shipping. They came directly from Annalee Company this way. Companion is 752100. Annalee Doll Description: Open eyes, red and black plaid flannel hat and scarf, green mittens. Great to leave out all winter. Annalee Doll Description: Open eyes, black nose, battered black hat, red with green tree print scarf, green and yellow mittens. Just change the scarf and display all winter long. Annalee Doll Description: Open eyes, black nose, wide brim red hat, multi-colored stars and stripes print scarf, red shawl with white fur trim, green and yellow mittens. Companion is 752000. Annalee Doll Description: Open eyes, carrot nose, green hat, yellow mittens, two black pom poms, red dress with yellow stars and green trees, holds broom, snow covered base. Companion is 752599. Annalee Doll Description: Last one. Very slight shelf dust, two very small beige spots the size of a pin head near her right wrist, otherwise she looks great. Open eyes, carrot nose, green hat, yellow mittens, two black pom poms, red dress with yellow stars and green trees, holds broom, snow covered base. Companion is 752599a. Annalee Doll Description: Open eyes, resin carrot nose, black hat with red band, blue and white snowflake print scarf, blue vest, red snowflake mittens, black boots, holds broom, snow base. Annalee Doll Description: Open eyes, resin carrot nose, blue cheeks, battered black hat with red snowflake band, three black buttons, red and white snowflake print scarf, green sparkle gloves, black boots, holds candy cane made of garland and accented with snowflakes and bows, white base. Candy cane wreath can be removed from hand and dispalyed all winter long. Annalee Doll Description: Open eyes, black pom nose, very light spots on white flannel body, black pom nose, green ear muffs, red scarf, green mittens, black hat with green band, two pom pom buttons, black boots, holds broom, snow base. Annalee Doll Description: Open eyes, black pom nose, white flannel body, green ear muffs, red scarf, green mittens, black hat with green band, two pom pom buttons, black boots, holds broom, snow base. White as not as white as Mint. Annalee Doll Description: Open eyes, felt carrot nose, discoloration on white flannel body, black pom nose, green ear muffs, red scarf, green mittens, black hat with green band, two pom pom buttons, black boots, holds broom, snow base. Annalee Doll Description: Last one. Open eyes, black nose, red hat with black band, green and white snowflake print scarf, black mittens and boots, snow base. Overall shelf dust on the white and fading on the red hat. has glue in the palm of the right hand where it originally held a broom. Sold as is. Annalee Doll Description: Last one. Open eyes, black nose, red hat with black band, green and white snowflake print scarf, black mittens and boots, holds broom, snow base. Overall shelf dust on the white flannel body and top of snow base from being dispayed in a store. Signed on the back left shoulder "Chuck & Karen Thordike '97". Annalee Doll Description: Open eyes, felt carrot nose, battered black hat, yellow mittens, two black pom poms, red scarf with yellow stars and green trees, holds shovel, snow covered base. Companion is 752499. Annalee Doll Description: Very slight shelf dust. Open eyes, felt carrot nose, battered black hat, yellow mittens, two black pom poms, red scarf with yellow stars and green trees, holds shovel, snow covered base. Companion is 752499a. Annalee Doll Description: Last one. Open eyes, black nose, black top hat and bow tie, white lace jabot, red scarf and wasitband, green gloves, black boots, poinsettia print vest, holds walking stick, snow base. Water stain on the bottom of snow base, does not detract from the doll, but wanted to mention it. Doll is mint, otherwise. Annalee Doll Description: Last one. Open eyes, black nose, black top hat and bow tie, white lace jabot, red scarf and wasitband, green gloves, black boots, poinsettia print vest, holds walking stick, snow base. White is more of an off-white and it is uniform. Does not detract from the doll, but wanted to mention it. Annalee Doll Description: Last one. Open eyes, felt carrot nose, black hat with chartreuse band, red ear muffs, chartreuse mittens and scarf, holds grey and black bird, wire stand. Very hard to find in this condition. Annalee Doll Description: Last one. Open eyes, felt carrot nose, black hat with chartreuse band, red ear muffs and mittens, chartreuse scarf, holds blue bird, wire stand. Very hard to find in this condition. Annalee Doll Description: Open eyes, felt carrot nose, black hat, red ear muffs and mittens, chartreuse hat band and scarf, holds green bird, wire stand. Very hard to find in this condition. Annalee Doll Description: Last one. Open eyes, felt carrot nose, black hat with chartreuse band, red ear muffs and mittens, chartreuse scarf, holds blue bird, wire stand. Very faint spot in left arm pit the size of a peppercorn. Not noticeable but wanted to mention it. Hard to find in this condition. Annalee Doll Description: Last one. Open eyes, felt carrot nose, black hat with chartreuse band, red ear muffs and mittens, chartreuse scarf, holds green bird, wire stand. Very faint spot on left hip, it might even wash off. Not noticeable but wanted to mention it. A vintage Annalee at a great price and he can stay out all winter long and feed the birds. Annalee Doll Description: Last one. Open eyes, felt carrot nose, black hat with chartreuse band, red ear muffs and mittens, chartreuse scarf, holds blue bird. Very faint spot on back of left leg, it might even wash off. Hole at back of right ankle where the stand was attached. Neither of these imperfections are noticeable when in the sitting position, but wanted to mention it. Annalee Doll Description: Last one. Open eyes, felt carrot nose, black hat with chartreuse band, green ear muffs and chartreuse mittens, red scarf, holds yellow bird, wire stand. White flannel is graded as excellent. A vintage Annalee at a great price and he can stay out all winter long and feed the birds. Annalee Doll Description: Last one. Open eyes, felt carrot nose, black hat with red band, red ear muffs and red mittens, chartruese scarf, holds yellow bird, wire stand. White flannel on the tops of the feet is graded as excellent. A vintage Annalee at a great price and he can stay out all winter long and feed the birds. Annalee Doll Description: Last one. Open eyes, felt carrot nose, black hat with chartreuse band, teal ear muffs, red scarf and mittens, holds bird, wire stand. Discoloration on white body and water stain on stomach. Almost impossible to find these mint condition due to the white flannel changing color through the years. Annalee Doll Description: Open eyes, felt carrot nose, black hat with chartreuse band, red ear muffs and mittens, chartreuse scarf, no bird, wire stand. Almost impossible to find these mint condition due to the white flannel changing color through the years. Slight fading on the chartreuse. White has overall discoloration. Annalee Doll Description: Last one. Open eyes, felt carrot nose, black hat with lime green band, green ear muffs, lime green mittens, red scarf, holds bird, wire stand. Very hard to find in this condition. Signed by Annalee on back in 1998. This doll came from the Annalee Museum. The museum tag number is 552. Annalee Doll Description: Last one. Open eyes, felt carrot nose, black hat with red band, green ear muffs, lime green mittens, red scarf, wire stand. White is not as white when compared to a mint doll but looks really nice.